In this 1943 color photo, parachutists sit on the bench seat of a C-47 awaiting instructions to stand up and hook-up. Note the brown jump boots and reserve (chest pack) parachutes. 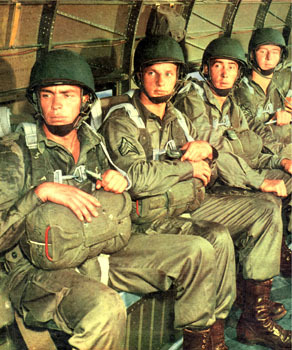 They are wearing the Type T-5 parachutes-the spring loaded clip fasteners of the main (back pack) chute harness are visible across the upper chests of the jumpers. These often tightened-up, due to the opening shock and descent, and many complaints were lodged by Normandy survivors that the buckles were too difficult and time-consuming to unfasten under combat conditions. Type T-5 chutes were used until mid 1944, at which time Riggers began converting them, by adding a harness equipped with a quick-release box to existing T-5's. 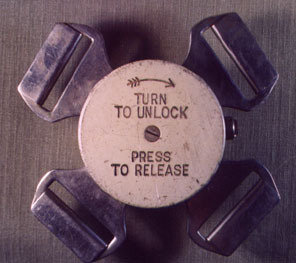 The quick release box pictured above was salvaged by Don Zahn of H/506th-later versions are not fully-round and have a straight edge on one side of the disc. The modified T-5's were forerunners of the T-7 chutes on which quick-release boxes were standard equipment. These jumpers are also holding the static line hook in their left hand-this was attached to a steel cable which ran the length of the aisle just below the ceiling of the plane. When the jumper exited the door, the static line played- out, ripping the cover off the back parachute. 'Prop blast' from the propellors helped the chute deploy automatically. Thus the jumper only had to exit with the proper body position and his chute would open automatically. The red ripcord handle of the chest reserve chute was only pulled in the event of a malfunction of the main chute. The U.S. Army switched to black boots circa 1958 (one of the technical mistakes in 'Saving Private Ryan'wherein paras are seen wearing black boots). Plates like this were sewn to the side of the main backpack of the T-5 parachute and this one indicates that the canopy inside is (multi shade green) Camouflage. Wartime records indicate that prior to D-Day, parachute manufacturers were shipping both white and camo chutes to England in equal numbers. Despite attempts to equip all D-Day jumpers with camo chutes, only about half of the chutes used on D-Day were camo chutes. The rest had glorious white canopies,which made splendid targets as the jumpers were floating to earth in thick machinegun fire. 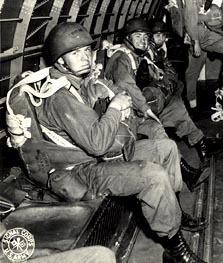 < On a practice jump in 1943, Ed Thomas above left, is seated near the exit door of a C-47 (cameraman was near the tail, facing toward the bulkhead). Ed belonged to G/502 but would later enter combat with I/502. His T-5 parachute rig can be seen to advantage here. Note how the main chute's bellyband passes behind and through the retainers on the rear of the chest parachute. A 'T' for Thomas and the last 4 digits of Ed's serial number can be seen stenciled on the front of his steel pot. He is also wearing early jump boots with brass eyelets for the laces. The photo above right shows Captain George Craft, the G/502 commander, acting as jumpmaster of the same stick. He is wearing an A-2 jacket with 502 bat wings and skull pocket patch. The last man of the stick, S/Sgt Charles Miller, is clearing the door. You can see how his static line is playing out, and will rip the pack cover off his parachute backpack. Two equipment bundles were pushed out first, followed by nine jumpers-total elapsed time was five seconds. Signal Corps photos courtesy of Ivan Hershner. 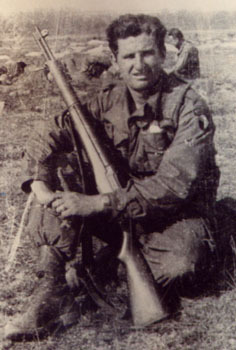 Lou Vecchi of H/506th holding the GI's best friend, the 30-06 caliber M-1 rifle designed by John Garand. Utilizing an 8 round clip, the gas-operated, semi auto weapon allowed the user to fire eight times, as fast as he could pull the trigger. This gave a distinct advantage over Axis opponents who were mostly using bolt-action rifles. photo c/o Bob Martin. 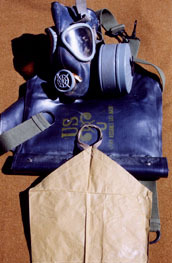 The heavy padded drop bag shown above, was worn by paratroopers when jumping with the M-1 rifle. The rifle was broken down into three sections: barrel, stock, and trigger group and zipped-up in this heavy canvas bag. A metal hook on the reverse attached the bag to a metal loop mounted high on the right chest portion of the main harness. The bag was tucked behind the reserve chute when jumping, on a 45 degree angle. Many complaints came from Normandy survivors who lost precious seconds removing their weapon from the 'Griswold Bag', and assembling and loading the M-1 while enemy troops encroached. Starting with Market-Garden, Riggers began mounting an extension on the Griswold Bags, enabling jumpers to descend with a fully assembled and loaded M-1 rifle in the bag. 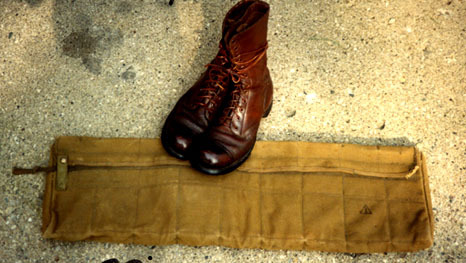 Also shown in the photo is a pair of spit-shined brown jump boots which belonged to Rudy Korvas of F/501. 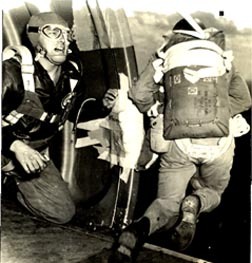 The photo above, taken upon landing on a practice jump in England, shows the leg scabbard commonly used as a holster for jumping the M1-A1 carbine, although other methods were also employed. U.S. Army photo courtesy Cecil Simmons. Light Machinegun M1919 A-4 This photo was made in Tennessee, in September, 1943, during 2nd Army Maneuvers. 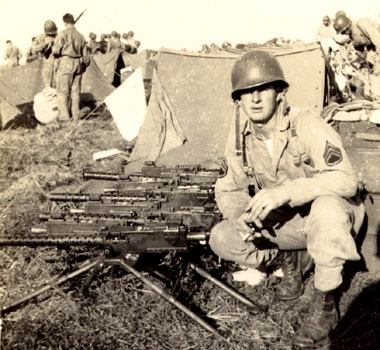 S/Sgt Arch Phillips the platoon Sgt of the HQ/3, 501 LMG platoon, is shown with the eight guns assigned to that platoon. This air-cooled, belt-fed, tripod mounted machine-gun laid the central base of fire for WW2 PIR tactics. In rifle companies, there was one LMG in each 12 man rifle squad, there were three to a rifle platoon and 9 to a rifle company. (Regular Infantry companies depended on the B.A.R.in each squad, to provide the base of fire for maneuvering against the enemy). The LMG platoon in each PIR battalion, assigned crews out for special support assignments to rifle companies, or on outposts. When not involved in mutual support duties, the LMG platoon personnel stayed together as a group. After Normandy, some modifications were made to the A-4 LMG, to give it transportability, with features copied from the German MG 34 and 42 guns. The new American 'A-6'LMG so-modified, had a shoulder stock, carrying handle, and a bi-pod under the muzzle, instead of mounting the weapon on a tripod. These modifications were disliked by many gunners, because of the limited traverse afforded by the bi-pod. Also, the shoulder stock tended to get in the way. So later war usage often saw the stock of the A-6 discarded, and the gun again mounted on a tripod. 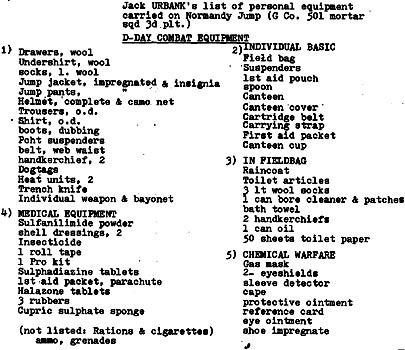 Individual Equipment List For Normandy Drop I transcribed the following list of equipment which was worn by Sgt John Urbank, 3d platoon Co.'G' 501 PIR into Normandy. This is from a handwritten list he made on a blank V Mail form. Many troopers who survived Normandy traveled much lighter on the next combat jump into Holland. However, there is so much interest in what, why, and how things were done on D-Day, it has become, in the words of Drew Cook: "The 'Holy of Holies' in WW2 Airborne Operations". Clay Blair wrote of Normandy in 'Ridgeways Paratroopers', describing it as "The stuff of instant legend." Major H.W. Hannah, the Regimental S-3 officer of the 506th PIR during Normandy, dug-up an old document with the following orders. Although the loads almost certainly changed on the Market-Garden drop, this is of interest to Normandy fans. MI- 30-06 rifle: Rounds per weapon: 136, jumped on individual. (128 in Air Corps pockets, 4 clips per pocket), 1-8 rnd. clip in rifle, hand, or jumpsuit pocket (55% ball, 40% AP, 5% tracer. Rifle belt and one bandolier may be used in lieu of the above. 60 Riflemen per company will jump with 1 belt of LMG ammunition (250 rounds); this may be used in M-1 rifles if the situation warrants. note from webmaster:-the "Air Corps pockets" were rectangular belt pouches, with a pointed flap secured by a press-a-dot snap. These were discontinued in the 101st after Normandy. The military term "ball" ammo means a lead projectile, completely covered with a copper jacket. Carbine: Rounds per weapon: 175, jumped on individual. 160 in 2 Air Corps pockets (2 clips and one box per pocket), 15 in hand (1 clip) or jumpsuit pocket (100% ball). Thompson SMG: Rounds per weapon:300, Jumped on individual. 14 (20 rnd) clips in jump suit pockets or M6 carrying bag, 1 clip in gun, hand, or jumpsuit pocket. Pistol M1911A1: Rounds per weapon: 21, jumped on individual. 2 clips in pouch, one clip in pistol (100% ball, for pistol and TSMG). '03 Rifle: Rounds per weapon: 145, jumped on individual. 140 in four Air Corps pockets (7 clips per pocket), 1 5 rnd. clip in rifle, hand, or jumpsuit pocket. The '03 rifle may not be used if launcher for M-1 rifle is issued. It is now a superimposed weapon and if jumped will have to supplant the primary weapon of the man jumping it. Rocket Launcher: Rounds per weapon: 12, to be jumped on individual. l round per man; collected and carried, 6 in each of 2 Infantry packs collected by crew after jump. The folding launcher may be issued, and can be jumped. Launchers may be dropped in bundles: if so, ammunition will be dropped in bundle. 60mm mortar: Rounds per weapon: 80, each mortar jumped on 3 men. 14 riflemen jump with 1 round each. 3 mortar squad members jump with 4 each in M6 bag; 54 dropped in bundles and carried in cart (4 carts per company). 81mm mortar: Rounds per weapon: 54, dropped in bundle;carried by 3 men. 30 rounds in cart, plus 6 rounds on each of 4 men, or 5 rounds on 4 men and 4 rounds on 1. (cart and all rounds dropped in bundle). 80% H.E. light, 20% White Phosphorus. LMG Browning M1919-A4: rounds per weapon: 3250, jumped on 2 individuals. In LMG platoon, 2,000 rounds dropped in bundle and carried on 81mm mortar cart, or by S-4. 1,250 rounds jumped on men. (80% A.P. and 20% tracer). A.P.=Armor-Piercing (steel cored projectile with copper jacket). 60 riflemen in each company jump with 1 belt of LMG ammunition, as indicated in M-1 rifle listing. The memo concludes;"These ammunition loads are considered to be all that can be carried away from field, regardless of whether machine-guns, 60mm mortars, rocket launchers, or '03 rifles are jumped on the individual or dropped in equipment bundles." Trench Knife M-3 The M3 trench knife was issued to paratroopers for use as a fighting knife. Over a dozen different companies made them on government contracts and some were maker marked on the blade, while later specimens are marked on the crossguard. Paratroopers usually carried these strapped to the ankle with web straps cut from musette bags, and a leather lace at the bottom to secure to the boot. Shown here is an M6 leather scabbard, and later knives were carried in an M8 fiber scabbard. Manufacture of these knives faded out in 1944, when the design was adapted to make the M-1 Carbine bayonet. Customized M-6 Scabbard Johnny Hahn was a Catholic trooper from a poor part of Philadelphia. Before entering the Army, he liked to shake down rich suburban kids for their money, when they came to Philly with their dates on Saturday nights. When Hahn was KIA along Hell's Highway, between Veghel-Koevering in September, 1944, his buddy Donald Zahn, wanted to keep something that had belonged to Hahn. Don salvaged Hahn's crossguard-marked M-3 Camillus trench knife, in a Milsco M-6 leather scabbard. This knife was added to the webmaster's collection in April of 2004. 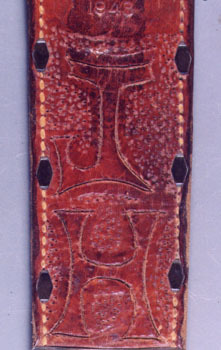 Details of the scabbard, which was hand-tooled by Johnny Hahn, appear above. 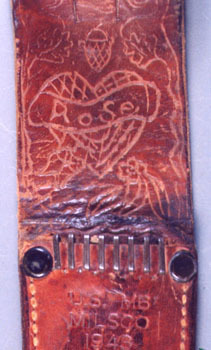 Above left, Hahn created a design centered around his girlfriend's name-Rose. This is on the upper backstrap of the scabbard, which is hidden behind the handle of the knife, when the knife is in the scabbard. At right, the front section of the scabbard between the date and the metal protective plate, on the portion of the scabbard that covered the blade. Hahn's stylized initials can be clearly seen. With Hahn's Camillus M3 knife inserted in the scabbard, the 'Rose' tooling on the upper portion of the scabbard strap is obscured by the knife handle. Before Johnny Hahn's body was removed by the Graves Registration detail, Don Zahn also salvaged the small medallions pictured above. 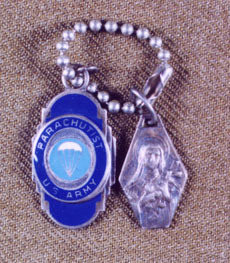 The US Army Parachutist charm was probably a PX purchase and I've never seen another like it. Also suspended from the same chain, was the Sacred Heart medallion pictured above. Dogtag charms courtesy Donald Zahn. Dug-Up Trench Knife Many visitors to this site have expressed interest in metal detecting and digging for artifacts on European battlefields. This illustrates the typical condition of an object that was dug-up after fifty years in the ground. This Case M-3 knife was unearthed in a Bastogne civilian's backyard in 1994. It is shown with its M-8 fiber type scabbard. The grateful Belgian gave it to visiting 1/506th veteran Ralph Campoy, on the 50th anniversary of the Bastogne fight. c/o R. Campoy. 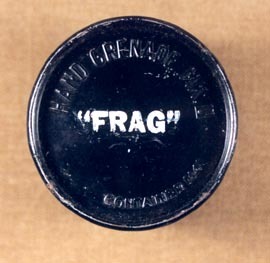 "Pineapple" Defensive fragmentation grenades were originally painted all yellow-the U.S. Army color code for High Explosives (H.E.). In early war battles in the Pacific, Japanese troops easily spotted the yellow grenades in the jungle, which frequently enabled them to toss them back before detonation. By the time of the Normandy Invasion, the color had been changed to green, with only a narrow yellow H.E. band around the neck. Photographic evidence indicates that the Army was still trying to use-up the early war yellow grenades in 1944, as some appear in Normandy Invasion photos. In the example shown, the yellow paint was applied before the green paint had dried, causing the yellow to 'bleed' into the green. This is characteristic of one particular maunfacturer. 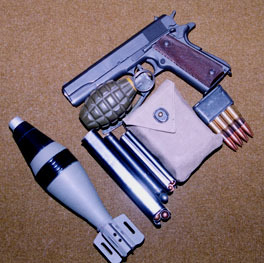 Grenades were shipped 24 to the case, in cylindrical cardboard containers, (the lid of one is illustrated below left). 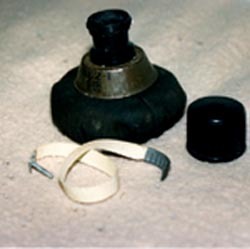 Don Burgett describes being on grenade- filling detail in England, pouring powder into grenade bodies-filling them only about one third full gave the desired result in powder combustion. Grenades proved useful in hedgerow fighting and house clearing, although it is interesting to know that some Parachute Riflemen like Leo Gillis (F/501) went through the entire war without ever tossing one in combat. 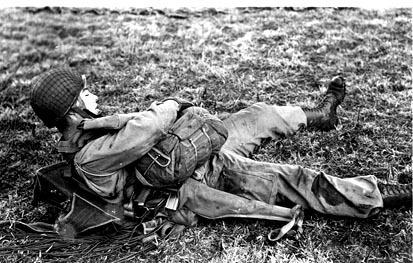 At Bloody Gulch on 13 June, 1944, 3/506th used several cases of grenades. 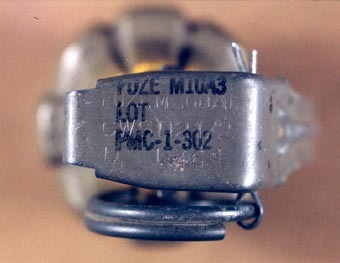 Further fuse information is overpainted atop the safety handle or 'spoon' of the grenade above right-other specs are stamped into the metal underneath. GAMMON GRENADE The British-made device known as the 'Gammon Grenade' was a mixed blessing. The cloth bag was stuffed with varying amounts of composition C-2, an early form of plastic explosive. This could create a blast comparable to an exploding 105mm artillery shell. 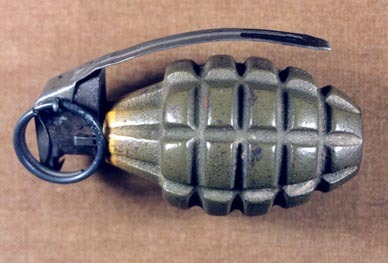 The user would hurl the grenade, holding onto the strap, which armed the device as it flew through the air. Although these grenades had a devastating effect on the target, they were almost as hazardous to the user. The fulmonite of Mercury detonators were highly unstable, and many instances of accidental detonation took place. Lt Robert Pick, an S-2 officer of the 502 PIR, was seriously injured in England during the summer of 1944, while demonstrating a Gammon Grenade. 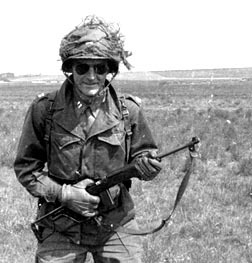 An 82nd Airborne trooper accidentally dropped one in Normandy while marching. It exploded, killing him and wounding several of his buddies. Photo courtesy Dennis Davies. GAS BRASSARD In the Normandy invasion, Allied troops were equipped with chemical warfare equipment, as it was still unknown whether Hitler would employ poison gas on the battlefield. All Allied Invasion clothing was saturated with CC-2, an oily, smelly gas repellant, and special assault gas masks were isssued in water resistant black rubberized bags. Arm brassards, made of a chemically impregnated light brown paper (resembling waxed paper), were to be worn on the shoulder. After sliding the armband up the sleeve, a small loop was threaded through the epaulette to secure it in place. These brassards would turn red if exposed to mustard gas. Photographic evidence indicates the 502 PIR probably enforced the rule to wear these, whereas they were only spottily worn in the 501 and 506th. 101st Headquarters and glider units also seemed to wear them. I suspect these were issued inside the gas mask bag, and in units where the rule to wear them was not enforced, the gas masks were thrown away after landing in France. Many troopers never even saw the brassards, as they never bothered to look inside the bags before discarding them. Ed Benecke of A/377th took the photo above outside St Marie du Mont on 7 June, 1944. 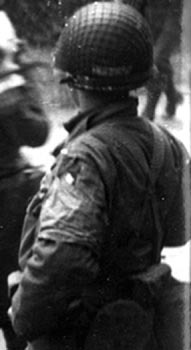 The man shown is wearing his gas brassard on the left shoulder, which mostly obscures the 101st eagle patch. Most troopers started out wearing them on the right shoulder, so their patch would still be visible, but they soon discovered this interfered with shouldering their rifle for firing. More Gas Warfare Equipment The assault gas mask was issued to Amphibious as well as Airborne troops for D-Day and other post-1943 Invasions It came disassembled, in a water-resistant, rubberized bag. The outer surface of the bag was reportedly not too durable. The filter for the mask screws into the left cheek as shown and was stored inside the mask while in the bag. Also shown is a gas detection arm brassard.